Here's a question for you: does the existence of "paleontologists" not also suggest the existence of "darkeontologists"? Or at least a "taneontologist"? After the T-rex tirade, Ellie is blown away as she searches through the wreckage left behind. She looks desperately for Grant and the kids, but find hardly a trace - just footprints leading into the dark jungle! Joking aside, Dr. Sattler isn't a paleontologist - she's a paleobotantist, which means she's concerned with plantlife rather than animals, and is therefore one of the key pieces in the "John Hammond is a scam artist" theory. You've heard that one, right? The idea is that his geneticists were not able to succesfully extract dino DNA (because even if it didn't naturally decay over time, it's not like bugs will only bite one animal and no others - try cloning something you found in that genetic stew and you're going to end up with a flesh Megazord), so they cobbled genes together and faked it; that's why there isn't a single feather to be found anywhere, and why the grounds could be covered in Dr. Sattler's extinct plants, despite the fact that mosquitos don't drink plant blood. Hammond didn't bring these scientists to the park to see if it was safe, he brought them to see if they'd fall for it. Because if trained scientists believed what they were seeing, so would whatever trusting families eventually walked through the gate. Jurassic Park was just another flea circus. That said, his goal was pretty much to create an Eden, and he did pretty much succeed at that, faked or no. For her part, Ellie's wardrobe fits both that Biblical allegory and the meta-plot of the movie: if the white-suited Hammond is the God of this paradise, then Ellie and Alan are the Eve and Adam: she wears a pink shirt to Grant's blue; meanwhile, she's wearing a second blue shirt under the pink one, hinting at the way the dinosaurs are supposed to all be female, but still find a way to reproduce. Pretty on the nose, costume supervisor Sue Moore! As far as giveaways go, that's right up there with what Alan does with the seatbelts. Dr. Sattler was played by Laura Dern, ages before dying her hair purple to be the ultra-badass Admiral Holdo. 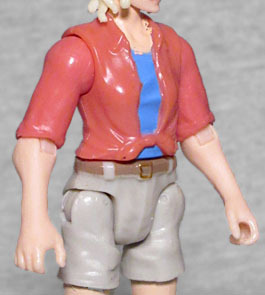 The likeness on this figure is better than the toys made in the '90s, of course, but not quite as good as the other two figures in this subline. It's something about the hair, I think - the face is "Dernish" enough, taken on its own, but the whole is less than the sum of its parts. Ellie's articulation is no worse than the boys' was, but neither is it any better. She moves at the knees, hips, waist, elbows, shoulders, and head. Most of those are swivel/hinge joints, with only the waist being a plain swivel. Obviously things could be better - there could be wrist swivels, literally any kind of ankle joint, etc. - but the Legacy Collection figures are already a step above the other Jurassic World: Fallen Kingdom humans, so asking Mattel to jump all the way up to GI Joe levels of quality is probably unlikely (if for no reason other than they're Mattel, and Mattel can't do things right). Her only accessory is a big flashlight. It's not the one she used in the film (see again what we just said above about Mattel always getting everything wrong), but the idea is clear and the light itself is detailed well enough - square black body, large bowl for the light, silver lens, all that. She can hold it in either hand. 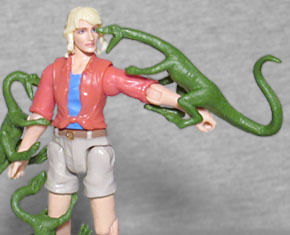 Like the other two figures, she also includes a Compsognathus to attack her, and yet its sculpt is completely different from the others we've already seen. Get all three figures, and you'll get three unique Compies to devour someone! Hers has its neck stretched way out, and the tail curled into an S.
Unsurprisingly, Dr. Ellie Sattler is the hardest figure in this series to find. Alan Grant and Robert Muldoon are more or less equally plentiful, but Ellie? Rare. 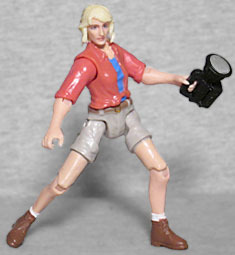 This review covers fully 50% of all the Ellie Sattler figures I've ever seen. The figures are decent, but not great, though they're still good enough that we're hoping for a Series 2. With, say, John Hammond, Ian Malcolm and... Dennis Nedry? The lawyer? A two-pack of Tim and Lex? Someone. Make it happen, Mattel! But make all the figures easy to find.